While Danny 'HuskY' Engels showed a perfect performance in Grid 2 during the last raceday in Brands Hatch, Bj&ouml;rn 'Biertrinker' Kajewski proved himself in the same grid with good and solid midfield positions. Today, though, hundred virtual racers are looking forward to a new chance and another raceday in the fifth VRTCC season. This time, players are facing eachother on the legendary racetrack of Imola. The circuit were one of the best racing drivers ever and probably an idol for many Sim-Racers, Ayrton Senna, had a fatal accident fifthten years ago. The 1st May 1994 will always be remembered as one of the saddest days in racing history. But today, the 11th May 2009, could be the most important day for the championship favorites in Virtual Racing. The event will be streamed live (german) by MultiBC 20:00 CEST. Tune in and follow the racing action! 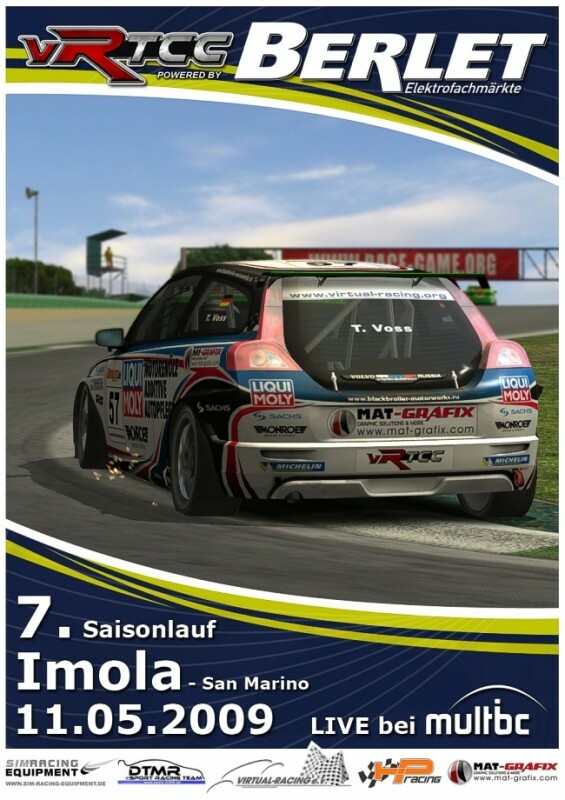 Get updated about the Virtual Racing Touring Car Championship Season Five and check if a SK Racing Pilot wins the Grand Prix of Imola and takes home the trophy.